Installing fireproof foam can make your building a safer place for the people who live, work and visit there. Without effective prevention measures, like adequate fire retardant foam, even a small fire can quickly grow to an inferno consuming a building and everything inside it in minutes. This makes fireproofing foam insulation not only a smart safety precaution, but a legal obligation in many areas. Arango Insulation has skilled associates to help you choose the right foam to suit your building, and we carry all the top brands. Our trained and certified technicians will make sure your solution is carefully planned and installed to exceed your building’s fire codes rather than just covering the bare minimum. While sprinklers and other measures may help put a fire out, fireproof foam prevents fires from spreading in the first place. 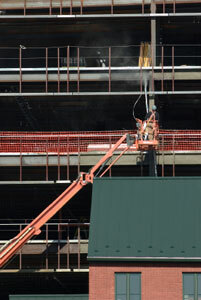 Whether you’re building a steel skyscraper in Atlanta or need extra protection around your old electrical circuits in Marietta, Arango Insulation can provide the fire prevention sprays you need to keep your business safe and the insulation to keep you comfortable. We never cut corners and our work is always backed by our one-year warranty. For more information about what Arango Insulation can do to protect your building with fireproof foam, or how we can meet any of your other needs, including installing insulation and serving as ac commercial roofer, contact us today.